Dit kaartje heb ik vanochtend gemaakt, naar een sketch van Create4fun. Het stempeltje is van Penny Black, de naam ben ik helaas kwijt, als iemand hem weet dan hoor ik het graag! Hij is ingekleurd met mn copics, het was een tijdje geleden dat ik ze gebruikt had, maar het blijft een fijn kleurmedium! Rondom het afdrukje heb ik stickles (Star Dust) gebruikt, net als op de sneeuwvlokken en rondom de tekst. Rondom het afdrukje heb ik met chalk wat blauw aangebracht. Leuk weer wat van je te horen Krista!! He is just darling! I love how you colored him and the patterend paper you used. Beautiful pastels and a cute little hedgie lovely coloured! I love your scrummy backing papers and cute image. So many gorgeous layers and different textures. 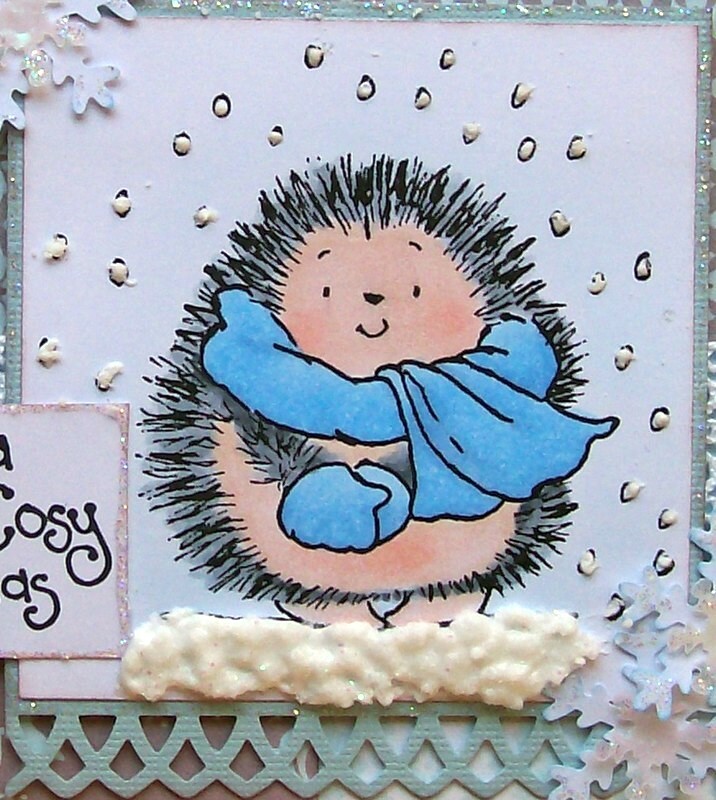 Fab card love the cute hedgehog thanks for joining us at Incy Wincy. How very cute!! 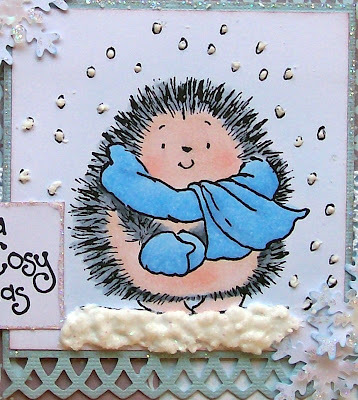 Love that hedgehog, gorgeous sketch and colors you used. Thanks so much for playing along with us at penny black @ all sorts, hope you join us again sometime! What a super Chrsistmas card. I love the DP's and warm colours which make a lovely alternative Christmas colour. I just adore your card Krista. Your little hedgie looks so cute and you have coloured him beautifully. Love the co-ordinated background papers too. Thank you for joining in with our challenge this month at Penny Black at Allsorts and we hope to see another of your lovely creations in our next challenge. this is lovely, great colours! Thank you so much for entering the Penny Black at Allsorts november challenge and good luck! Gorgeous card! Love the beautiful papers and your colouring, it's fab! Thanks for sharing at Penny Black @ Allsorts, hope to see you soon again!